Emanuel Derman was a quantitative analyst (Quant) at Goldman Sachs, one of the financial engineers whose mathematical models became crucial for Wall Street. The reliance investors put on such quantitative analysis was catastrophic for the economy, setting off the ongoing string of financial crises that began with the mortgage market in 2007 and continues through today. Here Derman looks at why people -- bankers in particular -- still put so much faith in these models, and why it's a terrible mistake to do so. Though financial models imitate the style of physics and employ the language of mathematics, ultimately they deal with human beings. There is a fundamental difference between the aims and potential achievements of physics and those of finance. In physics, theories aim for a description of reality; in finance, at best, models can shoot only for a simplistic and very limited approximation to it. When we make a model involving human beings, we are trying to force the ugly stepsister's foot into Cinderella's pretty glass slipper. It doesn't fit without cutting off some of the essential parts. Physicists and economists have been too enthusiastic to acknowledge the limits of their equations in the sphere of human behavior--which of course is what economics is all about. 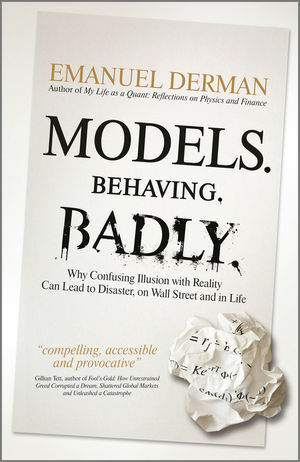 Models.Behaving.Badly includes a personal account of Derman's childhood encounters with failed models--the oppressions of apartheid and the utopia of the kibbutz. He describes his experience as a physicist on Wall Street, the models quants generated, the benefits they brought and the problems, practical and ethical, they caused. Derman takes a close look at what a model is, and then highlights the differences between the successes of modeling in physics and its failures in economics. Describing the collapse of the subprime mortgage CDO market in 2007, Derman urges us to stop the naïve reliance on these models, and offers suggestions for mending them. This is a fascinating, lyrical, and very human look behind the curtain at the intersection between mathematics and human nature. EMANUEL DERMAN is Head of Risk at Prisma Capital Partners and a professor at Columbia University, where he directs their program in financial engineering. He is the author of My Life As A Quant, one of Business Week's top ten books of the year, in which he introduced the quant world to a wide audience.